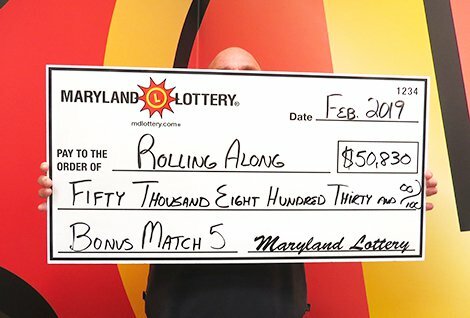 A happy Thurmont man is “Rolling Along” with his Bonus Match 5 top-prize win. If you took a weekend bus trip out of state recently and thought your driver seemed preoccupied, you were correct! A Thurmont grandfather of three and step-grandfather of even more got behind the wheel for his customers even though he had a $50,830 winning Bonus Match 5 ticket at home. Mr. “Rolling Along,” as he dubbed himself, has faithfully played Bonus Match 5 for three decades. The father of three always buys two $6 tickets and plays the same numbers. “I don’t know any more how I came up with them,” he said, smiling. On the day the loyal player was “Rolling Along” to buy his Lottery tickets, Sheetz #200 in Thurmont came into view. The retired firefighter, who worked nearly 24 years for a Maryland fire department, bought his Bonus Match 5 tickets for the Feb. 7 drawing and went on his way. “Rolling Along” also plays Pick 3, and has claimed a $3,500 prize in the past. The 52-year-old checks the fate of his Bonus Match 5 and Pick 3 tickets on his smartphone after the drawings.